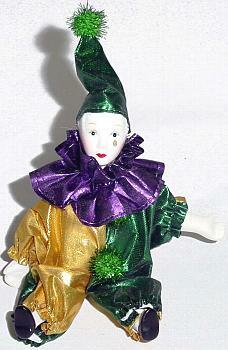 A margi gras clown doll dressed in purple, green & gold metallic fabric. It wears a green metallic clown hat. The doll stands 8" tall, and is approximately 6" tall when seated. At its widest point, the arms, it is approximately 5" wide.